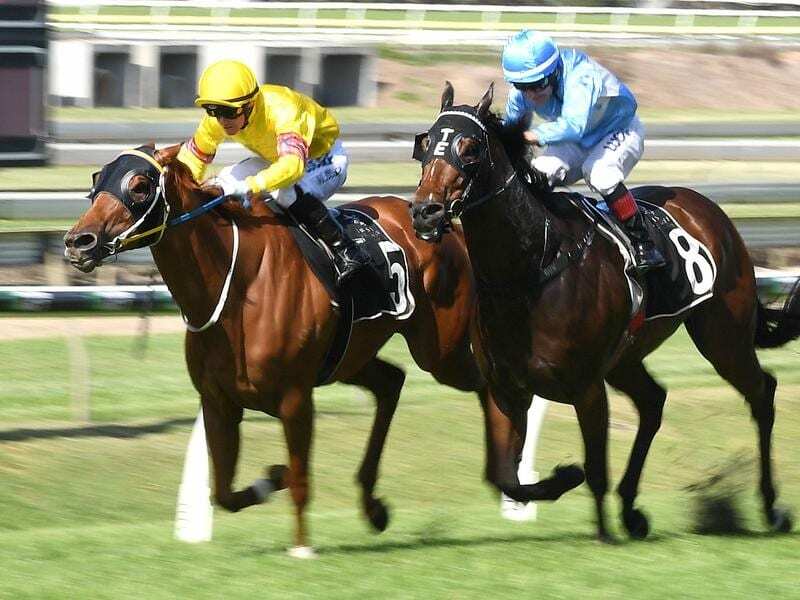 Volkoff (left) is primed to return in peak form at Eagle Farm after winning a recent barrier trial. A sparkling trial has indicated veteran mare Volkoff has lost none of her zest for racing as her swan song looms large. Volkoff is a rising eight-year-old but she has made the most of an extended extra year of racing. After winning the races in Perth, including two stakes events, Volkoff was sent to the Gold Coast to be sold as a broodmare at the National Magic Millions Sales. When she failed to make her reserve price, owner Paul Whyte decided to put her back into work with the Bryan and Daniel Guy training partnership on the Gold Coast. It has proved a wise decision with Volkoff winning two races and $104,000 in prize money for the Guys. In one of her wins Volkoff set a course record for 1050m at Doomben last year. She was one of the stars of the Gold Coast barrier trials last month when she ran slick time in beating Stradbroke Handicap hopeful Cadogan and stakes-placed The Chairman. In most of her races Volkoff has come from back in the field with a powerful final 200m but in the trial she showed the plenty of dash to lead all the way. The Guys have kept her ticking over while waiting for a suitable race for Volkoff to resume. It will be Volkoff’s first start on the big Eagle Farm track but Bryan Guy feels the mare will have no problems with it. “She has won on the big Sunshine Coast track beating a smart field so there should be no problems,” Guy said. The Guys are keen to continue their association with Whyte who has horses in several states. “There is a chance he will send us some younger horses which would be great,” Guy said.